Q. “ The film I want to see”, was released today, why don’t you have it? Q. Why did you only have " The film I want to see" for a week when other films are out for 3 or 4 weeks? Q. Why can't you tell me screening times more than a week ahead? Q. What does No Free List or No Free Tickets mean? Q. Do you have assigned Seating? Q. Can I use a Village or Hoyts pass at your cinema ? Q. I want to buy a ticket as a gift, can I do that? Q. I can't get there on a Wednesday, Can I only bring a baby to these sessions? Q. Can I buy my ticket online? Q. I cannot print my online ticket what do i do? Q. How do I get student concession price? Q. Why won’t you accept my old student card? Q. Will my learners permit, drivers license or Medicare card work as a student concession card? Q. I’m not from Sale, will you accept my interstate/ international student card? why can't I show you my club card and get the discount? Q. What’s the difference between M and MA15+ ratings? Q. Why can’t a parent just give permission for their child to see MA15+ rated films? A. Sometimes we simply cannot fit any more films in. We only have 3 screens and there is usually between 3 and 8 new films released each week. We keep most new films for 3 or 4 weeks. Just can't get them all. we will squeeze in an asked for film if we have a small gap between blockbusters. A. We are rarely 100% sure on what we will be getting more than a week in advance. This is due to films not doing as well as anticipated, or doing better than anticipated. Sometimes we can't get confirmation of a film booking until the Monday and the film starts on that Thursday. If you are having a party or fundraiser, we can generally work out a time for you. A. This means you cannot use complimentary passes to that film. A. Not at the moment. You can currently choose your own seat when you enter the cinema. A. No. We are an independent cinema and not affiliated with these cinemas. A. Yes, we have gift vouchers available for adults, children and seniors. Q. Do you have Cry Baby Sessions? Q. What is a Cry Baby Session? Q. Do you have baby facilities? A Babies are welcome to any session, but these allow for more noise than a regular session. Q. Can I buy my tickets online? A. If you are aged between 15 and 18 and at secondary school, you will automatically get the student price. If you are over 18 you will need to show a full time tertiary/student card. A. All student cards must be current and dated for the year. Showing an old card or a card with no year on it doesn’t tell us you are currently a student. A. You have to buy your tickets through the club. They offer discounts by purchasing bulk tickets that they either post to you or you print out. A. If the film is rated M then there are no restrictions and children are allowed to purchase their own ticket to see it. The M rating is only a recommendation. 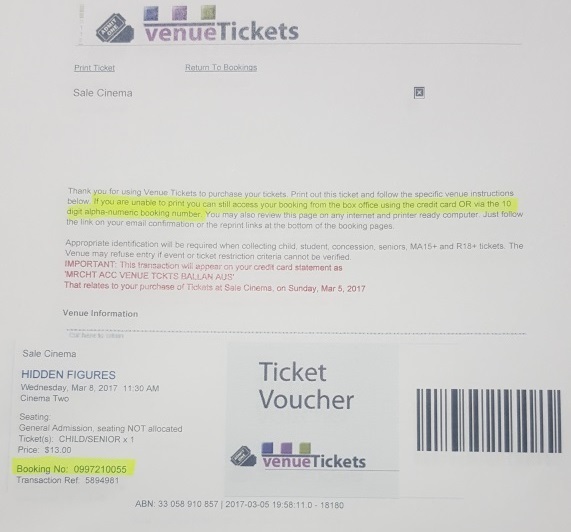 If the film is rated MA15+ then children under 15 can only see it if they are accompanied to the film by a parent or guardian over 18. A. The film ratings in Australia are law the same way a child under 18 cannot buy alcohol. The law states that a child under 15 must be accompanied to the film by an adult parent or guardian.